I’m not sure if it is part of being a mum, working for the health service or just me wanting to be able to help in an emergency but I always carry a first aid kit. I actually have several first aid kits scattered around between the house, the car and even when we go out on day trips. The one at home has been used most, with regular tops up of plasters, wipes and alcohol gel. Thankfully the one in the car has never needed to be used and I hope that it will sit in the glove compartment untouched but I can rest assured that it is there just in case. When the children were babies the first aid kit that I carried with me was a little different in that it also incorporated Calpol, teething powders and a thermometer – I can now leave those at home if we are only going away for the day but I must admit to carrying Calpol and a thermometer with us if we are away for a few days (when Tigger gets ill, he goes down pretty quickly). What do you need to carry in your first aid kit? 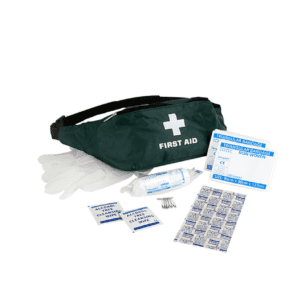 Depending on where you will be using your first aid depends on what you need to keep in it however there are some basics that you will need to carry. A 1 person first aid kit in a bum bag, for example, is perfect for when you are out and about, it can be worn, popped inside your bag or kept under the pushchair. From around the age of 11, I have always attended first aid training, firstly as part of the cadet force, I was with then later on as part of my work. I have (touch wood) never had to use my life-saving skills but had my share of cuts, eye washes and slings to attend to. Roo is a cub scout and one of their challenge badges is first aid and I have to say as a parent I am pleased to see that she will be learning about what to do in case of an emergency. Whilst I hope that she will never need to use her skills I also want her to be prepared and able to be relied upon if something does happen, whether it is just a cut finger, a sprained ankle or something life-threatening.